Home canning pear honey. Pear honey is really just pear jelly is made from either the peelings of pears or from the meat of pears. This page is going to show how to make and home can it from the pear peelings. I don’t use any pectin with this recipe and it comes out a very tender jelly. Pear jelly does not require using any store bought jell because the fruit has natural pectin and the lemon juice adds the acid it needs to form the jelly consistency. You will need a stock pot, the peelings and cores, minus seeds and stem ends, from 8c of peeled, chopped, cored pears (reserve the meat of the pears for the other pear honey recipe), 6-7 cups of water, 4c sugar and juice of 1 lemon. You will also need jars, flats, rings, paring knife, cheesecloth and paper towels. When home canning pear honey, to prepare the juice: wash pears in a clean sink or bowl of warm water. Peel the pears like you would peel a potato. I also use the cores along with the peels, but remove the seeds and stem ends. Reserve the meat of the pears for another pear honey recipe or to make another batch of pear honey when you taste how great it is. Cover the peelings in a stock pot with the 6-7 cups of water and cook until the pear peelings are soft. Smash the peelings and strain the now pear juice through cheesecloth to clarify it and add the lemon juice. Measure out how much juice you have in cups to make sure that you get the correct amount of sugar in. 8 cups of juice is the goal for this recipe. Pour the measured, clarified juice into the pot and heat over medium high heat. into hot jars. 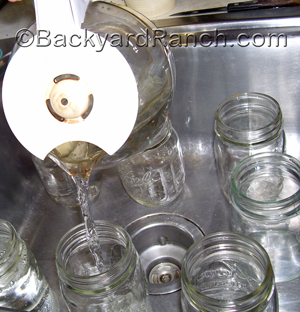 Leave 1/2″ head space above the mixture in the jar. Wipe the mouth of the jar with a clean paper towel and place a hot flat on the jar. Screw a ring over the flat hand tight. Process the jars in a hot water bath in a large pot for 5 minutes. Remove the jars and let cool. The flats will sink down in the middle and you will hear a popping sound when they seal. After the have cooled completely and the jars are sealed, you have just finished home canning pear honey. Store the jars in a cool, dark place. The pear honey make take anywhere from 24 hours to a week to completely set. Try not to shuffle them around too much until the pear honey has completely set.